Go to newsletter section of web page to download older Issues. April 18,09. I have posted four messages from the Kasson Mn. Bible Conference held on March 14th. Go to Audio Download and click on Kasson 2009. "Where are you Looking?" by Pastor Jim Haga. An important article on the relationship on baptism, faith and salvation. Go to Old Paths section and click on "Where are you Looking." I've posted in the Old Paths section the last chapter of a book written by P. Ljostveit entitled "Innermission Church History" and printed by the Hauge Innermission in 1948. The Chaper is entitled "The Church of Norway 1940-45". An account of the persecution under Nazi Germany. Posted!!!! Five messages on Audio Download page from the Forest City Conference on April 4-6th 2008. Go to Audio Downloads and click on Forest City Conference. I was not able to get an Audio from Sunday Mornings service, but If You want to read Toby Knutsons message, it is on the Newsletter Page, again click on Forest City Conference and download document. Also Go to Photo Album to see pictures. Check out "A Firm Footing" by Peder Fostervold. Peder was one of the driving forces behind the formation of the Hauge Innermission. What will you find on this web site? On the Audio page you will find MP3 files of the messages from recent conferences. The Photo gallery has photos from conferences, and gallery's of some of the old Haugeans. Han Nielson Hauge page has a brief biography of our namesake. Newsletters page has downloadable copies of our newsletter the "Morning Glory". 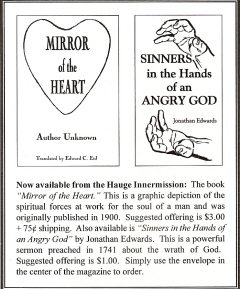 The Hauge Movement in America page has chapters posted from the book of the same name published in 1941. This is the history of the Hauge movement down through the ages. Appendix A: From Preserving a Godly Heritage. Explains the difference between Pietism and Missourianism. Assurance: By Pastor Maynard Force, as printed recently in the "Morning Glory". The tests from 1 John on how you can know (or not) if you have eternal life. HLIF Board Meeting following Annual Mtg. NOT ‘only’ for the Conference; but throughout! YOU are invited and please bring others with YOU!! Prayer Time at 9:00 - 9:30 a.m.
You can donate through this Web site by clicking the "Donate" button on either the top or side menu. What for upcoming details for Our June annual meeting. Details coming soon. We have now re-printed the daily devotional, "Altar Steps" by R.P. Haakonson. this devotional is suitable for daily devotions with children. Most of the devotions contain a stanza or two of an applicable hymn. This work was first published in 1947 and is very evangelistic. Finished copies are now available on a free will offering basis, with a suggested offering of $5.00 + $1.00 shipping. Four messages from the 2008 Annual Conference held at Emmanuel Lutheran Church, rural Wanamingo, Minnesota. Go to Audio Download page to download. Also check out Photo Gallary from the conference at Photo Gallary Page. In response to questions being asked concerning the objectives and ministries of the HAUGE LUTHERAN INNER MISSION FEDERATION, we share this brief information. While the Federation has enjoyed a long history among Lutheran Christians in many areas of this country, there are those, especially of the younger people who are quite unfamiliar with the movement. Should you be one of these, we trust this information will be helpful and informative. A FREE MOVEMENT AMONG LUTHERANS FOR SPIRITUAL LIFE. It is not to be confused with any church body or synod. Rather, it is a fellowship of Lutheran Christians working for revival and spiritual life within the existing church and throughout the Christian community. The “Hauge connection” identifies the movement historically with the Haugean revivals in Norway which had such a powerful impact upon that nation in the early nineteenth century. The Hauge Federation today exists as a REVIVAL MOVEMENT, stressing the desperate need of spiritual awakening and new life in Christ. A LAY-WITNESS MINISTRY IN THE HAUGEAN TRADITION. Following his conversion to Christ as a young farm boy, Hans Nielsen Hauge promptly felt the call to be a witness for Christ. He began at once sharing the Gospel with his neighbors and friends, and ultimately throughout the length and breadth of Norway. The Hauge Federation today is essentially a lay-movement encouraging spiritual life and leadership among the laypeople. While the involvement of pastors and of church leaders is always welcome, the work is directed largely by laymen. A RESOURCE MINISTRY FOR EVANGELISM. The Hauge Federation desires to be a spiritual resource providing assistance to pastors and churches in their evangelistic efforts. As an inter-Lutheran fellowship, the Federation is not bound by synodical affiliations, but is supportive of all Lutheran church bodies that are faithful to the Word of God. Some of the current ministries include: Spiritual Life Rallies in various areas, Evangelistic meetings, Bible conferences and an annual Weekend Retreat. Smaller fellowship/testimony meetings are encouraged.